​​​​ DALLAS-FORT WORTH – Marcus & Millichap has released the Multifamily Forecast Report for 2017, which can be viewed here. Employment: Staffing in the Metroplex will rise 2.9 percent this year as 105,000 workers are added. In 2016, employers created 130,500 jobs. Construction: Apartment construction is at a record level, and builders will bring 28,200 apartments online during 2017. Nearly 22,100 units were placed in service last year. Vacancy: The absorption of 20,200 apartments this year will fall short of supply additions, raising the vacancy rate 90 basis points to 5.1 percent. 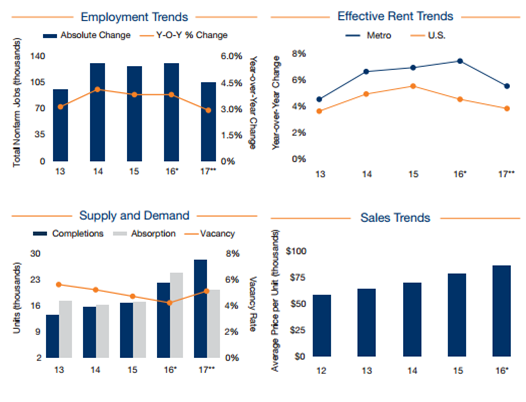 Last year, the vacancy rate fell 50 basis points. ​Want more data? See DFW Multifamily Market Research.